The new rig for the summer of 2019 are the Trampers. The ultimate Montana adventure vehicle is a 2018 Chevy Silverado 2500 HD Duramax diesel. It has the Z71 package with all the creature comforts of a Cadillac. This 4WD truck is a beast at getting you around Montana. It wouldn’t be an ultimate go-anywhere truck if it didn’t have a camper. So, these Silverado’s are equipped with 2020 Northstar 850SC truck campers. These campers sleep 2-3 comfortably and are equipped with everything you need to feel at home. There is a cassette toilet/shower, plenty of counter space and storage, a dining table that doubles as the 3rd bed, a fridge, and a furnace for those brisk summer nights. So bring a friend and hit the road this summer in one of the baddest rigs on the road. Towing is allowed with select vehicles and circumstances. The Trampers come with the LT package which includes, remote start, Bluetooth technology, heated and power front seats, leather interior, navigation and radio, and much more. With all this in the trucks, you technically won’t be roughing it, but nobody else has to know! There are seatbelts for 5, and the backseat is very roomy in the double-cab. The trucks have the standard 6.5 ft beds. 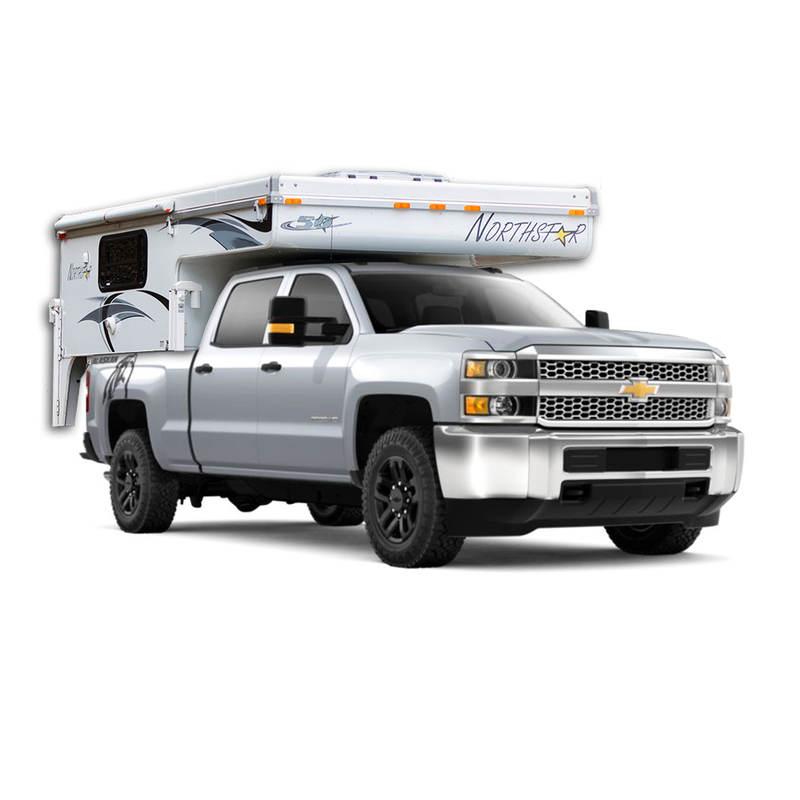 In the summer, the bed of the truck will have the Northstar 850SC truck camper. There will be plenty of storage in the camper itself to put your gear in while traveling. In the winter, there is a truck cap to store a ton of gear including skis and snowboards. The topper will keep everything dry and snow free, while you are traveling to Big Sky for a ski weekend. This is a truck mounted camper that rides with you anywhere. It has a 15′ overall length, which hangs over the top of the truck. There is a 30 gal freshwater tank, 13 gal greywater tank, and 5 gal blackwater/cassette toilet. It’s hooked up with a 16,000 BTU auto ignite furnace for those chilly evenings as well as pop up and pop-thru windows for ventilation. The campers are equipped with a cassette toilet and shower. A single sink with pull out sprayer, water heater, and plenty of counter space. On the counter is a top 2-burner stove to do your cooking. There is a 3-way refrigerator to keep your food chilled and accessible. The bed sleeps two, parallel to the truck to make getting in and out easier and quieter. A small dining table pulls out to make the 3rd bed. And finally, there is a small wardrobe in the corner to keep your clothes.